Rosetttamoon republishes this key article sent from a reader and encourages readers to send any outstanding news items for showcasing on Rosettamoon. Original contributions are also invited. IT crept up with such stealth that few people noticed it was even happening, but South Australia can now make fair claim to being the most secretive state in the country. The Advertiser revealed two stories this week that should deeply concern lovers of open debate and informed democracy, and leave them demanding big changes. After a period of welcome sunlight as court suppression orders sank to relative lows, they’ve spiked in the past two years and are running at their highest rate in a decade. On top of that, a Monash University study admonished our Freedom of Information laws as the worst in the country and found the system was “designed to block, delay and obfuscate”. But this viscous culture of secrecy isn’t isolated to those two important areas. It seeped so far into the foundations of our Independent Commission Against Corruption that even the man running it has complained to lawmakers that the public is shielded from important information. When the inquiry into the Gillman land deal was handed down, voters were forced to rely on summarised written accounts of what occurred. Unlike the national Royal Commission into Union Corruption or hearings of the NSW ICAC, we were denied the right to examine the full responses of ministers including their body language and tone and come to robust conclusions. The pervasive attitude within government appears to be one of keeping silent, writes Daniel Wills. SA also trails other states in the protections offered to whistleblowers and any journalists they contact in an honest bid to get important stories of public interest into the light of day. This has a chilling affect on political debate, and makes it more likely that bad practices will survive. There are a few decent theories that help explain why SA stands out so darkly in the crowd. Adelaide is a city just big enough to have institutions big enough with significant power but small enough that most of the people running them have personal connections to each other. In a very human way, this can quickly create an in-group of the ruling class who come to adopt common ways of thinking and lean on the side of giving each other the benefit of the doubt. When the ICAC legislation was drawn up the balance fell on the side of minimising the risk that people of standing would have their reputations unfairly smeared, rather than a bias towards ensuring the public had maximum access to information about what they were up to. It’s the kind of move that only someone already in power, who had themselves had the rare sensation of feeling victimised by public criticism’s pesky intrusion, would ever agree to make. Long-term governments also naturally tend toward the warm security blanket of confidentiality. It’s almost a fundamental law of political physics that time and mistakes grow in a directly proportional relationship to each other. In a world where your fundamental job is to make decisions every day, it is impossible to keep everyone happy. Another iron-clad guarantee of government is that at any single point in time there is a public servant somewhere doing something of infinite stupidity. The older a government becomes, the more skeletons it buries. Thousands of documents kept by the State Government have been refused under FOI laws. And perhaps the most troubling and ingrained problem is the incredible reliance on government that has developed in SA after two decades of genteel economic decline. Almost every single large business in SA now relies on the State Government for some kind of regulatory or financial support and many employ former Labor staffers at senior levels. It is commonplace for senior industry leaders to mutter under their breath about the lunacy of one government policy or another in private conversation and virtually sprint for the door at the most gentle suggestion they consider airing those concerns in the public square. The Government has now tipped millions into the balance sheets of major employers, this week for example spending $5 million on an unknown but we are assured very large number of jobs to be created in a new information technology business hub in the northeastern suburbs. It would be the height of bad manners, and a near certain guarantee the money tap would be closed in the future, if any of these businesses were to whine about the affairs of state. 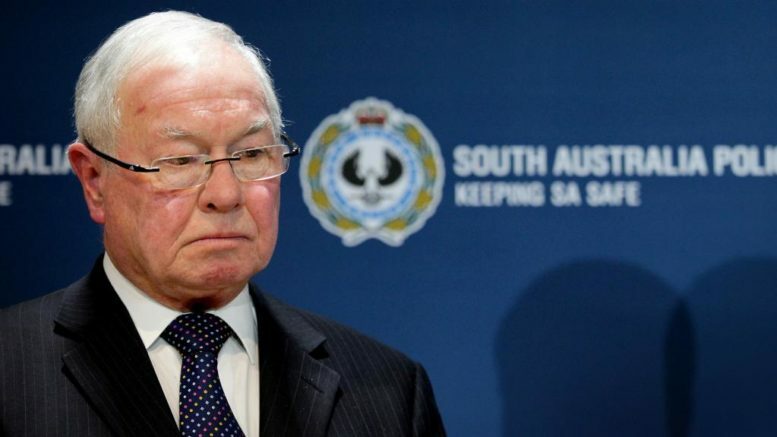 South Australians seeking anwers through freedom of information may be left disappointed. By example, Thoroughbred Racing SA conducted a demeaning exercise of politeness, self-censorship and submission to power in July by fining one industry figure for speaking up. Oakbank Racing Club chairman John Glatz was hit with a $5000 fine, understood to be the highest on record for a racing official in SA, after the Order of Australia Medal winner called Racing Minister Leon Bignell a “d…head” during a television interview. With a parliamentary report into the future of jumps racing looming, Thoroughbred Racing SA deemed Mr Glatz’s comments “prejudicial to the image” of the sport. It seemed a transparent bid to soothe the feelings of a man who could shut their enterprise down overnight if he wished. Let that be a lesson to the rest of you. Speech ain’t free if you say the wrong thing. Ultimately, all of these problems find their origin in the laws and disposition of the Government and Parliament generally. FOI, suppression and shield laws could be improved with a pen stroke. Premier Jay Weatherill differentiated himself from predecessor Mike Rann within days of taking the Labor leadership by bending to public demands and setting up an ICAC. Mr Weatherill followed that up with a promise to proactively release ministerial credit card statements. They’re lovely sentiments, well expressed, and worthy of regularly revisiting. poor poor secretive Adelaide and SA, look what a mess you have made………. Timely article with the Open State talkfest coming up. Will Daniel get a speaking gig I wonder? I do find the fact that everyone in town is reliant on government sector income of one sort or another incredibly stifling of free speech. We live in a bureaucracy. Democracy is elsewhere. SA is actually not that secretive because we are small enough that everyone knows everyone else’s business. Anything of any substance spreads through the rumour mill. And let’s not forget the current Speaker of the House, Michael Atkinson, went to great lengths to try and uncover the names and addresses of anyone who dared to post negative comments about the Labor Government in adelaidenow stories. And in 2010 the SA Labor Government introduced legislation to try and censor Internet commentary but was forced to back down by huge public outcry. This is a government that is truly scared of open scrutiny. The Australian Press Council has ruled on your claim that I had tried to censor the Internet in 2009/10. It ruled that The Advertiser-AdelaideNow claim was false and ordered it to publish a truthful account. What I tried to do in 2009/10 was apply the same rules to election-related publications on-line in the campaign period as had applied throughout living memory to print and still do. So, to give you an example that is not fanciful: If a person publishes in the campaign period “Candidate X is a paedo,” he or she must supply his or her real name and the postcode if his or her enrolled address. The Council ruled, after hearing from The Advertiser at length, that that was not censorship. A few years later the result in the NSW electorate of East Hills was affected by the publication of just such an anonymous imputation. No evidence existed for the imputation. A person has been charged. @Michael My claim is that you, Mr Speaker, have in the past gone to great lengths to try and uncover the identity of those who comment unfavourably on Labor Government stories. That is indeed factual – in 2010 you even went so far as to claim that one person who posted a comment on an Adelaide Now story was a ‘fictitious’ Liberal Party as your attempt to identify him via an electoral roll search failed to find him. The Tiser later revealed the person did indeed exist and was a resident of your own electorate. And the Press Council merely ruled that the term ‘censor’ was an inaccurate term to describe your actions at that time. @Michael Given that the government is subsidising or providing incentives to various enterprises, there is a compelling case for anonymity. As Mr Wills points out, there is a reasonable apprehension that people who speak out against the government could be targeted. That is one example of the enormous disparity in power and resources available to the government and its ministers, compared to those possessed by the vast majority of us. Censorship does not always involve minions of the state auditing and sanitising content to suit itself. The same result can be achieved just as effectively through intimidation and uncertainty leading people to censor themselves, as would have been the effect of your 2009/10 ambitions. It is ironic that the party in government was founded upon a recognition of the imbalances of power in our society, and the need to protect the majority from the predations of the powerful, has adopted the worst habits of the powerful. Secret deals, suppression orders, millions spent on political marketing rather than service delivery to the public and the appointment of Labor Party mates and union officials to key government and board positions across government who keep a very close watch on responses to FOI requests from the media or public. The current Chinese delegation visiting South Australia that was provided with a guided and traffic controlled police motorcade across the city to their hotels must feel like they are back home . The relevant Minister, Leon Bignell, does not have the power to ban jumps racing. A ban needs legislation and he does not have the numbers to get it through both houses. Nick Xenophon Team has voted for jumps to continue. So Daniel Wills’s column rests on a flawed assumption. The fine on John Glatz for his oafish insult and mistaken claim about Mr Bignell and the Government’s representation at the two days if Oakbank had little if anything to do with racing authorities being frightened of the State Government and everything to do with ancient quarrels within the racing industry. No mention of News Limited (and The Adveriser) organising blanket suppression of names of journalists found by Australian Press Council to have breached standards of journalism. Their names are not included in the adjudication. It’s like leaving the name of the convicted person out of a jusge’s sentencing remarks.